The BBFC rating reveals not only how old you need to be to buy Arkham City, but how long you could be playing it for as well. The videogame ratings boards in the US and UK both agree that Batman: Arkham City is suitable for teenagers, but it seems they disagree on just how old those teens should be. The ESRB gave the game a Teen rating, but its British counterpart, the BBFC, has set the bar a little higher, by rating it a 15. Unlike the ESRB, the BBFC doesn't go into much detail about why it has rating the game in the way it has, although it does note that the game has "strong violence," which at least gives an indication. Unlike the ESRB rating, the BBFC ratings are enforceable by law, rather than just at a store's discretion. 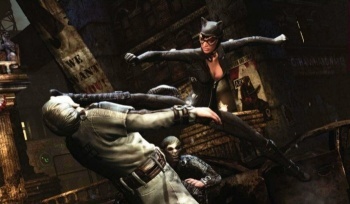 The rating does reveal, however that Arkham City has less than three hours of cut scenes. As Rocksteady estimate that the game is about 40 hours long, that's a lot of gliding, punching and crime-solving for gamers to sink their teeth into.